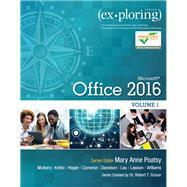 by Poatsy, Mary Anne; Mulbery, Keith; Krebs, Cynthia; Hogan, Lynn; Cameron, Eric; Davidson, Jason; Lau, Linda; Lawson, Rebecca; Williams, Jerri; Grauer, Robert T.
This book covers introductory Microsoft Word, Excel, Access, and PowerPoint, with an additional Windows 10 chapter. Mary Anne is a senior faculty member at Montgomery County Community College, teaching various computer application and concepts courses in face-to-face and online environments. She holds a B.A. in Psychology and Education from Mount Holyoke College and an M.B.A. in Finance from Northwestern University’s Kellogg Graduate School of Management. Mary Anne has more than 12 years of educational experience. She is currently adjunct faculty at Gwynedd-Mercy College and Montgomery County Community College. She has also taught at Bucks County Community College and Muhlenberg College, as well as conducted personal training. Before teaching, she was Vice President at Shearson Lehman in the Municipal Bond Investment Banking Department. Dr. Keith Mulbery is the Department Chair and a Professor in the Information Systems and Technology Department at Utah Valley University (UVU), where he currently teaches systems analysis and design, and global and ethical issues in information systems and technology. He has also taught computer applications, C# programming, and management information systems. Keith served as Interim Associate Dean, School of Computing, in the College of Technology and Computing at UVU. Keith received the Utah Valley State College Board of Trustees Award of Excellence in 2001, School of Technology and Computing Scholar Award in 2007, and School of Technology and Computing Teaching Award in 2008. He has authored more than 17 textbooks, served as Series Editor for the Exploring Office 2007 series, and served as developmental editor on two textbooks for the Essentials Office 2000 series. He is frequently asked to give presentations and workshops on Microsoft Office Excel at various education conferences. Keith received his B.S. and M.Ed. in Business Education from Southwestern Oklahoma State University and earned his Ph.D. in Education with an emphasis in Business Information Systems at Utah State University. His dissertation topic was computer-assisted instruction using Prentice Hall’s Train and Assess IT program (the predecessor to MyITLab) to supplement traditional instruction in basic computer proficiency courses. Cynthia Krebs is the Program Director of Business and Marketing Education at Utah Valley University. She is a tenured professor in the Information Systems and Technology Department at UVU where she teaches the Methods of Teaching Business, Marketing, and Digital Technology course to future teachers, as well as classes in basic computer applications and business proficiency applications. She holds a B.S and M.S. in Business Education with an emphasis in Economic Education. Cynthia has received numerous awards, and has presented extensively at the local, regional, and national levels as well as consulting with government organizations and businesses. Cynthia lives by a peaceful creek I in Springville, Utah. When she isn’t teaching or writing, she enjoys spending time with her children, spoiling her grandchildren Ava, Bode, Solee, Morgan, and Preslee. She loves traveling and reading. Lynn Hogan teaches at the University of North Alabama, providing instruction in the area of computer applications. With over 30 years of educational experience at the community college and university level, Lynn has taught applications, programming, and concepts courses in both online and classroom environments. She received an M.B.A. from the University of North Alabama and a Ph.D. from the University of Alabama. Lynn is a co-author of Practical Computing and has served on the authoring team of Your Office as well as the Exploring Office 2010 series. She resides in Alabama with her husband and two daughters. Eric Cameron is a tenured Associate Professor at Passaic County Community College, where he has taught in the Computer and Information Sciences department since 2001. He holds an M.S. in Computer Science and a B.S. degree in Computer Science with minors in Mathematics and Physics, both from Montclair State University. He currently co-chairs the College’s General Education committee and served as a member of the College’s Academic Assessment, College Writing, and Educational Technology committees at various points. Eric has also developed degrees in Graphic Design and Medical Informatics for the College. Eric previously worked as a software engineer both as a full-time employee and contractor, most recently for ITT/Exelis (now part of Harris Corporation). This is Eric’s fourth publication for Pearson, after authoring Web 2.0 and Windows 8 books in the Your Office series and co-authoring the Exploring Access 2013 text. Jason Davidson is a faculty member in the College of Business at Butler University, where he teaches Advanced Web Design, Data Networks, Data Analysis and Business Modeling, and introductory information systems courses. He is the co-author of Exploring Microsoft Excel 2013 Comprehensive, Exploring Microsoft Office 2013 Volume 2, Exploring Microsoft Office 2013 Plus, and Exploring VBA for Microsoft Office 2013. With a background in media development, prior to joining the faculty at Butler, he worked in the technical publishing industry. Along with teaching, he currently serves as an IT consultant for regional businesses in the Indianapolis area. He holds a B.A. in Telecommunication Arts from Butler University and an M.B.A. from Morehead State University. He lives in Indianapolis, Indiana, and in his free time enjoys road biking, photography, and spending time with his family. Since 1994, Dr. Linda K. Lau is a Management Information Systems (MIS) faculty at the College of Business and Economics, Longwood University, located in Farmville, Virginia. She received the Outstanding Academic Advisor Award in 2006. Besides teaching and advising, Linda has authored and co-authored numerous journal and conference articles and textbooks, edited two books, and sat on several editorial boards. Her current research interest focuses on cyber security and forensics, and she is the associate editor for the Journal of Digital Forensics, Security and Law (JDFSL). Linda earned her Ph.D. from Rensselaer Polytechnic Institute in 1993, and her MBA and Bachelor of Science from Illinois State University in 1987 and 1986, respectively. In her younger days, Linda worked as a flight attendant for Singapore International Airlines for six years before coming to America to pursue her academic dream. She also worked as a financial consultant with Salomon Smith Barney from 1999—2000 before returning to the academic world. Linda resides in Richmond with her family. Rebecca Lawson is a professor in the Computer Information Technologies program at Lansing Community College. She coordinates the curriculum, develops the instructional materials, and teaches for the E-Business curriculum. She also serves as the Online Faculty Coordinator at the Center for Teaching Excellence at LCC. In that role, she develops and facilitates online workshops for faculty learning to teach online. Her major areas of interest include online curriculum quality assurance, the review and development of printed and online instructional materials, the assessment of computer and Internet literacy skill levels to facilitate student retention, and the use of social networking tools to support learning in blended and online learning environments. Jerri Williams is a Senior Instructor at Montgomery County Community College in Pennsylvania. Jerri also works as an independent corporate trainer, technical editor, and content developer. She is interested in travel, cooking, movies, and tending to her colonial farmhouse. Jerri is married, and is the mother of two daughters, Holly (an Accounting graduate and full-time mother to an adorable son, Meir) and Gwyneth (a corporate defense attorney). Jerri and Gareth live in the suburbs of Philadelphia. They enjoy their home and garden, and spending time with family and good friends. Amy Rutledge is a Special Instructor of Management Information Systems at Oakland University in Rochester, Michigan. She coordinates academic programs in Microsoft Office applications and introductory management information systems courses for the School of Business Administration. Before joining Oakland University as an instructor, Amy spent several years working for a music distribution company and automotive manufacturer in various corporate roles including IT project management. She holds a B.S. in Business Administration specializing in Management Information Systems, and a B.A. in French Modern Language and Literature. She holds an M.B.A from Oakland University. She resides in Michigan with her husband, Dan and daughters Emma and Jane. Bob Grauer is an Associate Professor in the Department of Computer Information Systems at the University of Miami, where he is a multiple winner of the Outstanding Teaching Award in the School of Business, most recently in 2009. He has written numerous COBOL texts and is the vision behind the Exploring Office series, with more than three million books in print. His work has been translated into three foreign languages and is used in all aspects of higher education at both national and international levels. Bob Grauer has consulted for several major corporations including IBM and American Express. He received his Ph.D. in Operations Research in 1972 from the Polytechnic Institute of Brooklyn.